No fewer than 116 Nigerians have been dispatched to their early graves in the country through extra-judicial means in the last two years, according to Special Assistant to the President on Foreign Affairs and Diaspora, Mrs Abike Dabiri-Erewa. A dependable source close to the Nigerian community told the News Agency of Nigeria (NAN) on telephone from Johannesburg on Tuesday that the first victim, Ikechukwu Mmanwoke Edmond, 40, was killed on Nov. 11. The source said the deceased, a businessman and native of Ihembosi, Ekwusigo Local Government Area of Anambra, was killed in front of his house on Amant Street, Malvern, Johannesburg. “ When she (Sibongile ) raised alarm, they started beating her. When Ikechukwu came in and saw what was happening, he brought out his phone to call the police. “A member of the gang took a brick and hit him in the face and he fell down. When the police arrived, he was already dead,” the source told NAN. According to the source, police said they have commenced “investigation’’ into the death of the businessman. 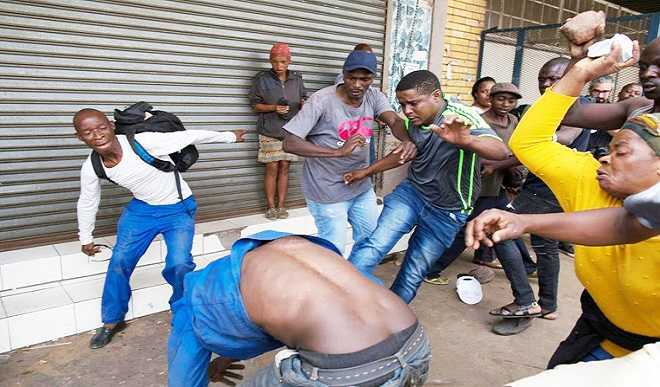 The second victim, Eluka Agu, native of Ihiala also from Anambra, was allegedly robbed and then beaten by some South Africans at Oliven, Centurion on Monday (Nov. 13). The said the police came and took him away to his house for a search. “The victim pleaded with the police to take him to the hospital for treatment but they refused. “ After searching his house without finding anything, he died as a result of the severe beating’’. Dabiri-Erewa, while reacting to the gruesome killing of a Nigerian, Tochukwu Nnadi, by police in South Africa which has brought the number of Nigerians massacred in the country to 20 in 2016 alone, had described it as “unacceptable to the people and government of Nigeria’’.